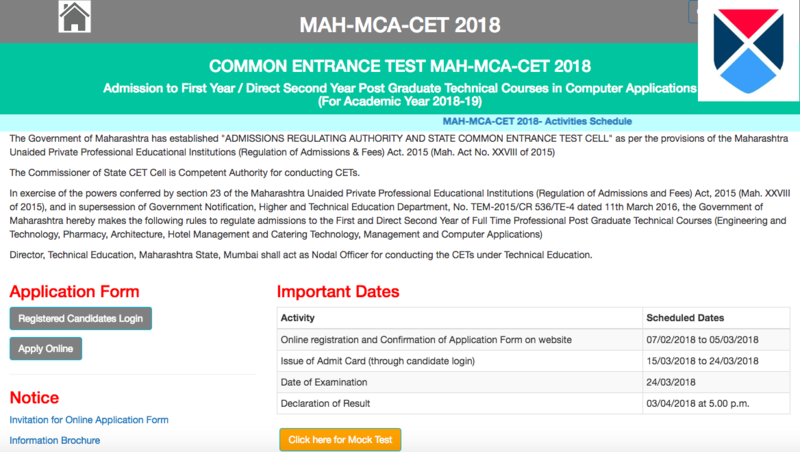 Official Website: MAH MCA CET 2019 Admit Card or Hall Ticket for the examination can be downloaded from the Official Website of DTE Maharashtra. Availability: The Admit card for MAH MCA CET 2019 will be available from 8th March 2019 to 24th March 2019. Details on Card: MAH MCA CET 2019 Hall Ticket or Admit Card contains information such as Exam Centre Name, Roll Number, Examination Date and Time, etc. Note: The candidate will not be allowed to enter without your MAH MCA CET exam centre without your Admit Card. Syllabus: For better scores, refer the complete MAH CET 2019 Syllabus. Exam Pattern: It is advisable for candidates to know the complete MAH MCA CET 2019 Exam Pattern before attending the examination. Mock Test: The candidates can take the official MAH MCA CET 2019 mock test. Reference Books: Candidates can refer these books for MAH MCA CET 2019. Issuance: The MAH MCA CET 2019 admit card will be issued to only those candidates who have successfully submitted their MAH MCA CET 2019 application form before the last date. Mandatory: No candidate will be allowed to appear for the MAH MCA CET 2019 examination without the MAH MCA CET 2019 admit card and the downloaded MAH MCA CET 2019 admit card will be considered as a valid admit card. Identity Proof: The candidates need to carry a photo identity proof along with the MAH MCA CET 2019 admit card in the examination. Mode: The MAH MCA CET 2019 admit card will be issued only online and will not be sent to anyone via post or email. Preserve: The MAH MCA CET 2019 admit card must be kept safe by the candidates. Counselling: Candidates must have the MAH MCA CET 2019 admit card with them at all times during the examination and counselling process. Tamper: Tampering with the MAH MCA CET 2019 admit card is not allowed. Mal Practice: If any candidate is found to be plagiarising the MAH MCA CET 2019 admit card, he/she will have to face consequences as the MAH MCA CET 2019 admit card can be issued only by the SRM University. In case, if the candidates have forgotten their MAH MCA CET 2019 password, they can change/reset the password immediately by following the below procedures. Go to the MAH MCA CET 2019 official site. Visit the Registered candidate's login link. Here, the candidates can find three rows for entering their Application number, Mobile number and the E-mail Address. 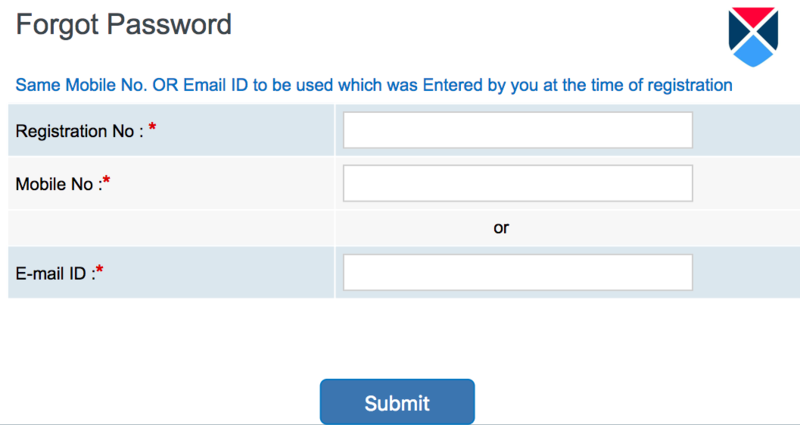 After entering the above three details, a link will be sent to the registered email and phone number, where the candidates can reset their password. Step 1: Reaching Official Site. Browsers: The recommended browsers are Google Chrome, Mozilla and Safari. Landing Site: Candidates should visit the official site of MAH MCA CET 2019 i.e., https://www.dtemaharashtra.gov.in/mcacet2018/. Reference: The candidates will see the below image on their screen. Step 2: Navigation to Admit Card Link. Click on the MAH MCA CET 2019 Admit Card download link which redirects to the login page as shown below. Identification: Enter the Credentials like Application/Registration number, password/DOB and the screen Captcha. Download: Then Download the MAH MCA CET 2019 Admit Card and take the print out. Preserve: Carefully preserve the Admit card till the MAH MCA CET 2019 Admission process gets completed. Verify the details: The admit card contains details and instructions regarding the exam. It is essential that candidates verify the details on the admit card. Authentication of the details on the admit card is essential. Discrepancies and Preservation: Any discrepancies in the admit card should be reported to the exam conducting body immediately. A downloaded copy of the admit card will be considered as valid. Candidates must preserve the Admit Card until the admission process is over for the purpose of verification. Take extra copies: It is advisable that candidates have a few extra copies of the admit card. After the release of Admit card, the exam will be conducted on 23rd March 2019. The MAH MCA CET 2019 Counselling process will commence from 2nd June 2019 and the eligible candidates can take part in this process. Candidates can download the Official MAH MCA CET 2019 Sample papers and practice them to prepare well.